Imagine if you will, what a mature Donkey Kong film directed by Guy Ritchie might look like. We’re talking gratuitous violence, plenty of action, a killer soundtrack, and a big monkey (of course). As bizarre as that combination sounds it’s actually pretty close to the premise and execution of what Ape Out is all about, and what makes it such an intense, satisfying, and ultimately, addictive little title. You control an Ape, who for all intents and purposes is trying to get Out, to escape from their confines and reach the outside world, a metaphor for his freedom, presumably. All that stands between you and your goal is a combination of winding corridors and rooms inconveniently filled with gun-toting enemies hell-bent on stopping you in your tracks. So, no chance of a Booker Prize here, but that misses the point entirely. 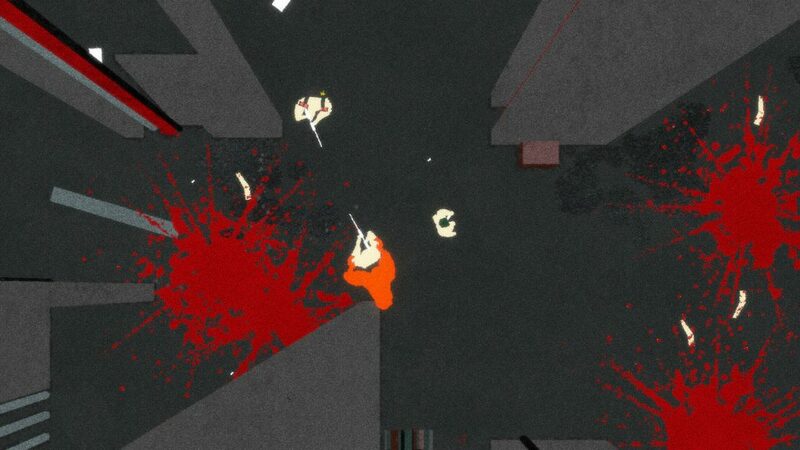 The game plays out in 2D from a top-down perspective, and starts with you in a small cage, and a few guards with guns milling about around you. A prompt on screen calls you to press the right-trigger on my Switch, you turn to face the direction of the nearest guard, and dutifully oblige. Within moments the cage is shattered, and what’s left of the guard’s insides appears to have created an impromptu Jackson Pollock on a nearby wall to a timely cymbal crash. Further drums, cymbals and brass chime in to the clear tension and panic created, but there’s no time to enjoy it, as the other alerted guards have realised the commotion and are honing their weapon sights clearly on your furry behind. Diving behind walls and pillars is your best chance to confuse the hunters on my tail. You look for an opening and pounce out at them before they have time to react and before long there’s more interior decorating courtesy of the lifeblood of your enemies, to which we celebrate with some raucous jazz-flute and a flurry of drums. Creating carnage hasn’t felt this good for a long time. To keep things fresh as you progress through the levels there are various enemy types to contend with, some with different strengths, weapons and attack patterns, requiring different tactics to overcome if you don’t want to become metaphorical Swiss cheese. To help, as well as the lunge that proved so successful at taking life earlier, you can also use a grab motion to take hold of enemies, and use them as a human shield that also fires at will at other enemies if you direct the fire correctly. Then, when you feel the enemy has fulfilled it’s usefulness, you can launch them at another enemy or nearby wall to kill them proper. 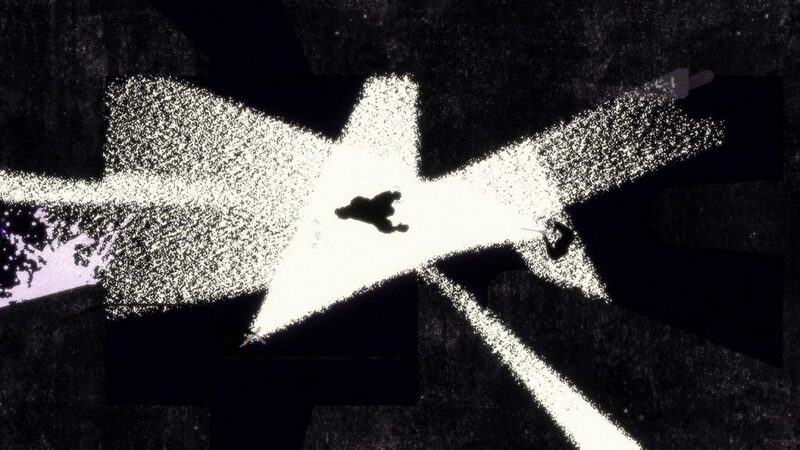 The environments themselves also have more variety than at first glance, as those rooms and corridors may have alarms in them which alert nearby guards, or a section where everything is pitch black, and the only light sources are on the sights on enemy guns, requiring a whole new strategy. Further progression sees you ditch gloomy corridors for a high-rise office building you need to descend, with SAS style gunners jumping though the windows, or a sniper aiming at you from a separate building providing different challenges But with those challenges also comes satisfying opportunities as you launch enemies out of the window of the 20th floor, and see their body plummet to a gooey mess on the pavement below. There’s a “three strikes and you’re out” mechanic at work here, meaning you’re OK if you sustain gunfire twice, but a further hit before the end of the level and the screen goes black, meaning you need to start again from the beginning. But as a useful tip when you succumb to death, the level zooms out to show both the overall layout of the current level, and also the path you just took through it and nearby enemies that you discovered. It means should you can better plan your routes through the environments which can otherwise feel a little labyrinthine due to their repetitive nature. And even though certain enemy movements change between levels, it still allows you to learn a bit more with each death, and go again. And so to that perfect combo of apes and jazz. 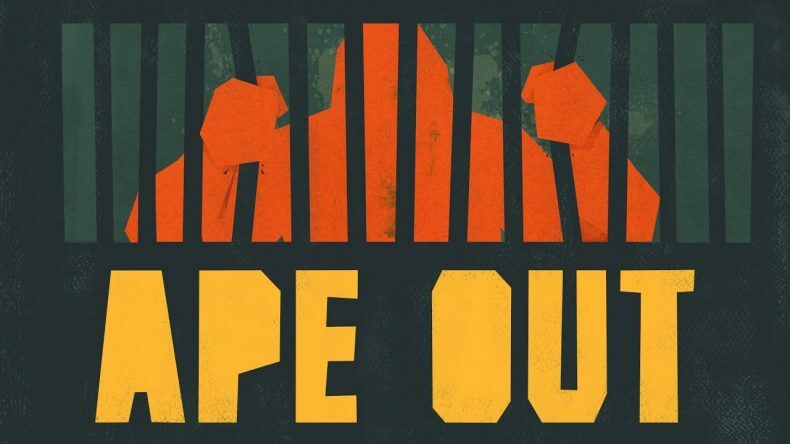 The musical accompaniment in Ape Out (as you may have already guessed) is enthralling. 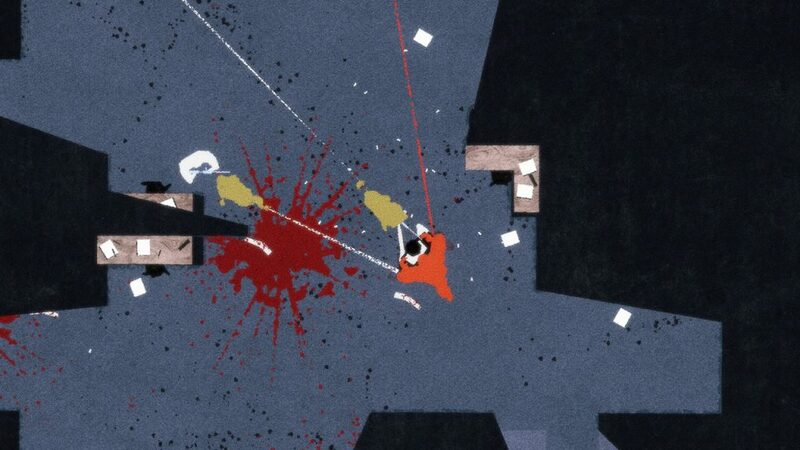 With a few blares of a trumpet or bangs of a tom-tom drum it perfectly captures the catharsis associated with the casual violence on display here, as well as the continuous tension of being hunted by enemies yet to have their skull come face to face with a wall. Its tempo drives you ever onward towards your goal even to the point of over-exuberance. Often I found myself full of adrenaline thanks to the latest jazz crescendo, that I’d foolishly rush the next section and get overwhelmed by enemies. A stark reminder that this game is best played as a mix between high-paced dexterity and careful planning if you want to succeed. And when you do, nothing will surpass the celebratory burst of jazz as your reward. The choice of a top-down perspective, and then offering a verticality to the walls and corridors does a great job of ramping up the tension. You can only see what is in the ape’s field of vision most of the time, giving a sense of claustrophobia to add to the need to outpace and outmanoeuvre your foes. The limited health dynamic makes for tough runs and frantic movement but at no point does it ever feel unfair, and in an instant you can be back in the action thanks to quick restarts and levels which don’t feel too big to overcome in a single run. It’s a great fit for Switch: an adrenaline hit such as this is better suited to smaller doses, and nothing releases the tension of a bad day at the office by grabbing hold of someone and decimating them with brute force. It plays well, the combination of visuals and sounds never pushing the Switch to its limit, meaning you can concentrate on enjoying the experience in the moment. True, the overall run-time of a few hours may put some people off, but that is ignoring the fun you’ll have with it. And it feels very much like a title you’ll happily fire up after a break to gorge in its unique experience again and again. It’s an energetic, enjoyable mix of sounds and action, that feels so intuitive, almost primal, perfectly represented by the ape you control. Its simple premise has developing layers which create a learning curve that is both challenging but attainable, and more to the point, wholly enjoyable. And all that with a up-beat jazz accompaniment that is equal parts invigorating and just down-right awesome. You won’t have played anything quite like this before, and it is perfect foil to other games in your library that don’t contain that unarguably glorious pairing of apes and jazz.